When I was in high school I didn’t know where to find Jewish music. I found an obscure and now defunct Israeli website that had a really odd mix of about 10 music videos and I would play them over and over, which I’m sure my roommate was thrilled with. One of the songs was Kol Hamispalel. I had no idea who these kids were, and it was back in 2006 so I don’t think Google pulled much up, but I watched the video so many times I can see it playing it my head. Needless to say, YBC will always have a place in my heart. I keep the second half of the sefira. That means that after Lag B’Omer I had to see the new CD by the checkout in the grocery store taunting me for what seemed like forever until I could listen as well. 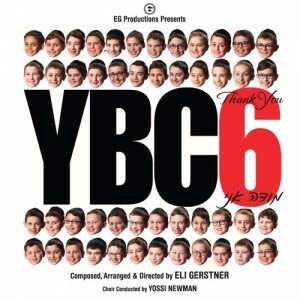 I was mostly taunted by the new Yeshiva Boys Choir CD, Modeh Ani. Part of me thinks that their CDs are aimed at children, but most of me doesn’t care, because these CDs are great. So now that I have listened to the CD many times (this is my new policy, because I once wrote that an Eitan Katz song was “not my favorite” and ended up walking down to it at my wedding…), I have not been disappointed. I’ve listened to it over and over again and found myself singing it at work. The CD has a good mix of songs but at the same time is 100% YBC and Eli Gerstner. The album starts with a bang with this electric rock song. It stays intense throughout the whole song. I love the harmonies at 2:10. Despite being over 5:00, since the song is constantly changing things up, it seems a lot shorter. A lot of fun and a great start to the album. One of my favorite songs here. To contrast the previous track we have a beautiful ballad in “Ilon”. Unlike most songs, this is clearly divided between solos and the choir. There are only solos until 2:24, at which point the choir sings together until we have an appearance from Eli Gerstner at 4:40. This song really showcases some of the star voices of the group. It’s a gentle and pretty song that sounds almost like a lullaby. I love the way the group sounds together singing slower songs. Like I said on my previous YBC reviews, YBC is known for catchy pop songs. We all know they (with Eli Gerstner, of course) can do them vey well. But I think we need to start paying attention to this gorgeous slow songs as well. This one is probably my favorite slow song. Back to the fun songs! We got a preview of this one in a video put out a few weeks ago. It’s a signature YBC techno song. It makes you want to get up and dance – or if you’re driving sing along! Especially to the “ooh ooh oohs” at 3:10. If you are generally a fan of YBC, this song is one you are sure to love. It’s a great song that screams YBC! There’s no song called Modeh Ani on the album, but this essentially is the “Thank You” the title track. Obviously it’s an English song about gratitude. The chorus is Modeh Ani (in Hebrew) with a little bit of English mixed in. I love the speaking part that goes into a beautiful Hebrew solo around 5:00; it’s a unique touch. The lyrics are beautiful– listing things we have to be grateful for, and it definitely makes you reflect. I think it’s very difficult to make English songs that aren’t stories anything but very cheesy, and Eli Gerstner expertly avoided this. It’s a very genuine song. However, since English songs aren’t my favorite and for the most part neither are slow songs, I would’ve made a different song the title song (maybe Y’Halilu or Chaim?). We are keeping a pattern here– another fast song. This song has a really old school feel to it, and I like it! There’s a guest appearance from Ohad around 2:25. He has one of the best voices in Jewish music and we saw on Kinderlach’s album as well as his Birchos Habanim song that he is great singing with kids. It’s short and simple in a lot of ways but that’s what makes it great. The straight-forwardness of it is refreshing. Definitely one of my favorite songs on the album. “Chazak chazak chazak!” This song also has a signature YBC feel to it, lots of techno and effects , and it makes you want to jump around. This could definitely be a single, a great song that represents YBC well with fun solos, a catchy beat, and great harmonies. It’s upbeat and overall a great song. One of my favorites on the album. A beautiful violin intro tells us that the pattern will continue with a slow song. It’s not quite as slow, and has a sort of dark and serious feeling to it with the violins and the electric guitar sprinkled throughout. A good solid song. A fast song, with a fun bagpipes intro. This one also is constantly changing things up and seems short despite being over 5:00 (most of the songs are over 5:00). I LOVE the English solo at 3:42 — “Give us life, give us wealth, give us peace, please give us health,” it’s gorgeous and very heartfelt. This song really sounds like they are davening for everything in the song and is incredibly genuine. Aside from the being catchy, fun, and sounding great, that’s why I love it! This is one I could listen to over and over and is probably my favorite song on the album. The pattern finally breaks with another very fast catchy song. A lot of it has a back and forth — solo , choir, solo choir— which is fun. The arrangements will keep you on your toes. The album ending with a bang makes us want more– when is YBC 7 coming out? As with virtually all good albums, if you like Jewish music then you will appreciate this album. But specifically fans of YBC and EG in general will be thrilled with it. With YBC you basically know what you are getting as every album is unmistakably a YBC album, but they keep getting better and better in my opinion. Enjoy! a) YM Gerstner is the special guest on Mamlichos , not Eli. b) YM is NOT featured on Chaim, although some of the soloists might sound like he did when he was in the choir. 2 of Eli’s sons are in the choir now. The yougest one I believe sings in da ma, it’s the one with the baby voice (not in a bad way). So the one that sounds alot like YM could be his older son. each & every song on here is amazing!! so different that the other cd’s & other cd’s out there, by far my favorites are Vihaviyosim, Dama & mamlichos & of course Yihalilu!!! love the solos on it!! eli’s kids have solo’s on Ki Avi(the older one) and Da Ma (the younger one), not on chaim, I think this album is the best Eli has ever put out, i love all the songs!!! llon #2 Was creative. Good job!